Basil is an herb that is now being widely cultivated for both its culinary and medicinal uses. The origin of basil is thought to be in India. Over the centuries (some say 5,000 years) it has made its way across continents and taken deep roots in kitchens and apothecaries around the world but particularly in Italy, Thailand, Vietnam, Laos, Indonesia and Cambodia – each developing their own varieties and cultivars based on their varying climates. It is thought that compounds in basil oil have potent antioxidant, antiviral, and antimicrobial properties. In India particular varieties of Holy Basil, Tulsi, have been traditionally been used for supplementary treatment of stress, diabetes, digestive and respiratory conditions. – Genovese, Sweet Basil are the round leafed, common Italian basil that is most widely cultivated and retailed in U.S. It is most often used in Italian cuisine, the main ingredient of pesto. – Thai Basil (horapha) has small narrow leaves and purple stems and is more heat stable, meaning that it keeps its flavor better under high or extended cooking temperatures. It is the basil most often used in curries. (This is the basil in the image on this page). – Holy Basil (Tulsi, Tulasi, Thai Holy Basil or kraphao) is perhaps one of the oldest cultivar and most revered of all basils. It is widely and deeply used in India as a medicinal in Ayurvedic treatments and as tea. In Thailand it is known as kraphao and is a central ingredient in stir fry and noodle dishes, it is different from Thai Basil. In India, several varieties of Tulsi are cultivated specific to use and climate. 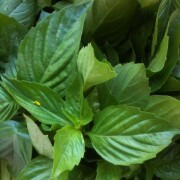 – Lemon basil (Thai Lemon Basil or maenglak, Lao Basil) has a strong lemon taste and scent. It contains a chemical called citral that is not found in other basils. It’s most widely used in Lao and Indonesian cuisines in stews and salads. Its delicate white flowers can be harvested to be used as a lovely and zesty condiment. – Adding basil to any soup or salad brings a nice fresh green beauty and flavor. – Basil flowers are a nice addition to iced delicate green or white teas. Limeades or lemonades too. Look for bunches of basil that are high in color, supple in leaf, free of wilt and damage. If you can get bunches with roots still on, even better. If for just a few days before using, you can free your bunch from the twisty tie and wrap with a damp paper towel, place in a plastic bag or air tight container in the fridge. If you want to keep basil for more than a few days, untie the bunch and stick the ends in a cup of water and cover loosely with a plastic bag on the counter out of the sun. If roots are still on, you don’t need to cover with the bag. Clip as you need. Change the water daily. Another option is to buy yourself a basil plant and clip as you need. Basil plants do well near a window with daily watering (water in the sink so as to flush with water, not little sips that let the minerals build up). Clip as you need. Then replant outside or compost. Be sure to always pinch off the flowers of a basil plant if you want it to keep producing leaves. I add the basil flowers to my lemonade or iced tea.